Traditional Christmas dinner has its own importance around the world, it particularly reflects the culture of the country. Mind-blowing table decors will surely make the dinner an unforgettable one for your guests and friends. Add a centerpiece to the table to convert the boring plain look into the coolest table you’ve never ever seen. Move on to select bright and lovely centerpieces to pop up the table for dinner. Don’t just take a look but a bite too to taste these colorful edible centerpieces. It is a treat for both eyes and mouth. 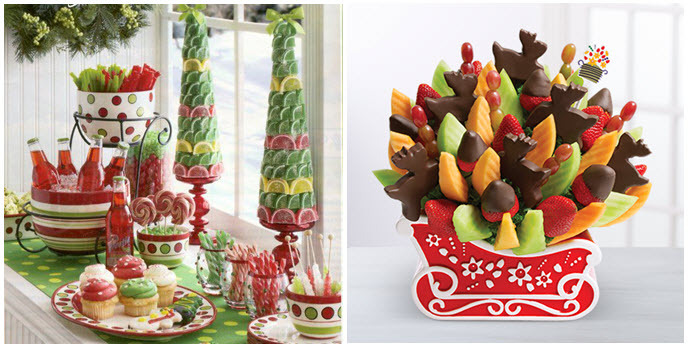 The creamy ginger bread snowy house, Choco dipped fruit bouquet in reindeer sleigh will bring in a tasty festive glow to the table. Watch your little ones enjoy the fun filled dinner with their favorite sweet treats. Wreath with candles or lanterns turn to look absolutely gorgeous when kept as centerpiece. The traditional red and green, the bright lantern piece are really very impressive to liven up the occasion. The pleasing combo of wreath with candles is sure to keep the tradition alive. Want to add a rustic vibe to your table? 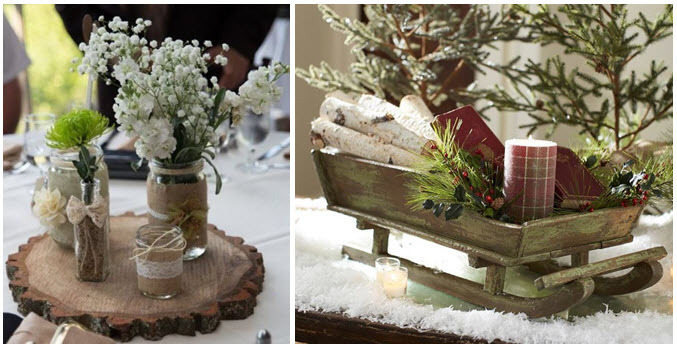 Check out the rustic sleigh with candles, mason jar on wooden log the best festive way to spruce up the dinner table. These brilliant rustic centerpieces make your table rock retro. Dress up your holiday table with a mix of bright shiny ornaments. Simple and artistic ornaments placed in transparent bowls are sure to be wowed. The blue bauble with star, hand blown glass baubles gets you into the spirit of the festive season. These are simply stunning! A fragrant punchy floral centerpiece adds perfect classy touch to your table décor. The bubble bowl with fresh flowers, the golden flavor floral arrangement is truly the apt centerpiece to steal the show. Display these natural beauties along with candles to add more festive flavor. Bring in the charm and magic to your dinner table with these stylish centerpieces. Decors with silver and white combined with blue is always a winning combination for trendy looks. The fish style, the amber lily flower are the exciting adorable centerpieces just right for a Christmas dinner. DIY centerpieces are amazing standout decorations that won’t hurt the pocket. The eco design made with cardboard, spicy candle center piece looks relatively easy, even you could do this quickly. There are lots more exciting DIY centerpieces simple but elegant in looks. A centerpiece should always add to the space correlating with the room and the table. There are countless ideas depending on your creativity that would really change the appearance of the room. Choose bright colors to match your décor themes as they add a sense of elegance to the table. 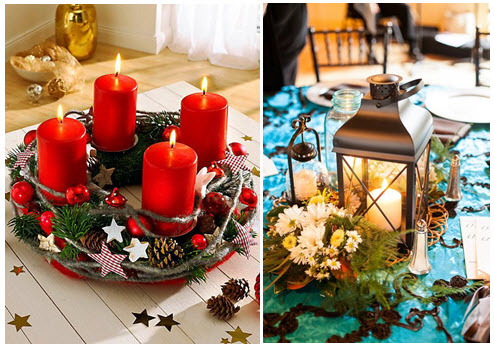 Try these interesting centerpieces to liven up your dinning and have fun with family and friends this festive season.